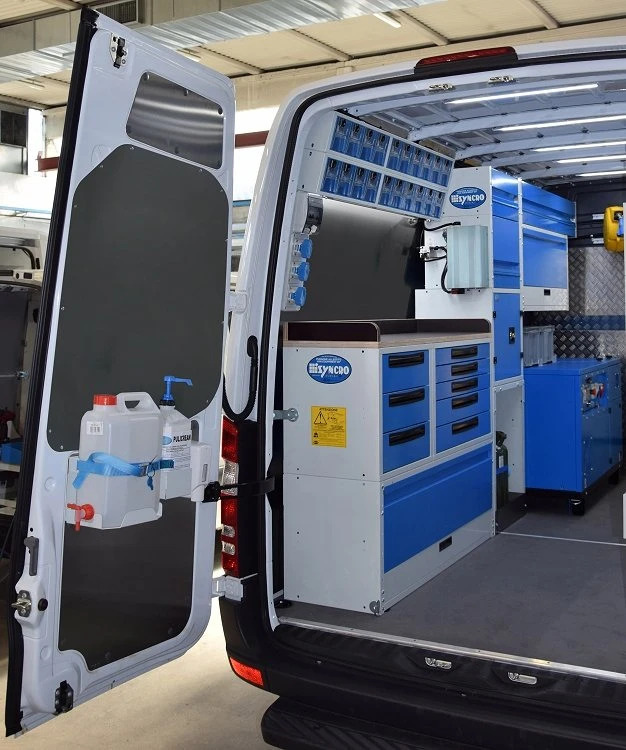 Find out how the Syncro team transformed this Sprinter into a perfect workshop on wheels. The Sprinter is the large van offering of German manufacturer Mercedes. It first appeared in 1996. A second series was launched in 2006. The Sprinter boasts all the characteristics commonly associated with Mercedes, including robustness, reliability and high performance. Unlike most of the commercial vehicles in the same class, the Sprinter comes with a choice of rear-wheel drive or all-wheel drive. Front-wheel drive is not available. This makes the Sprinter particularly suitable for carrying heavy loads though it also means that the cargo floor is somewhat higher that on equivalent size vans with front-wheel drive. 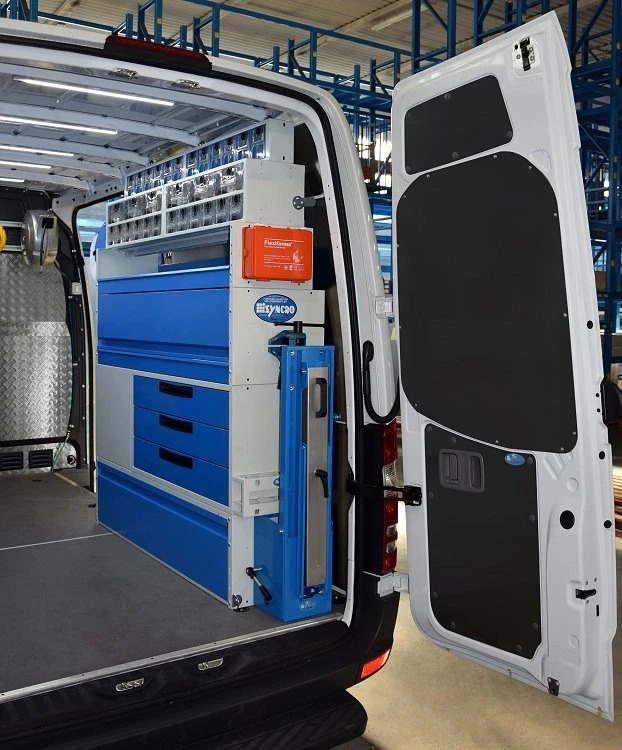 The generous, square load compartment is perfect for transporting cargo and for installing the sort of racking needed to create an efficient mobile workshop like that illustrated on this page. Earth moving machines include all kinds of industrial machine designed for earth moving operations, especially for construction purposes but also for landscaping, trenching and embankment building. 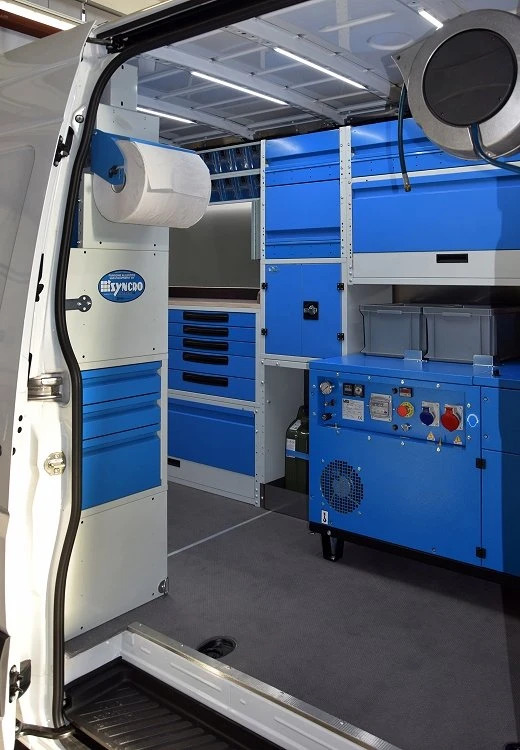 The user of this particular Sprinter commissioned Syncro System to install a mobile workshop for servicing machines like bulldozers, excavators, shovels and digger-loaders in the field, in situations that demand ultra-short down times. The answer to this need, of course, comes in the form of a van fitted out as a mobile workshop ready to intervene rapidly and effectively to solve whatever problems occur with earth moving machinery at the customer’s premises or at a construction site. As usual, the first stage in this Sprinter’s conversion was to fit body liners. The walls of the load compartment come with virtually no protection against impacts by shifting or falling cargo and require resistant liners to avoid serious damage over the years. The Sprinter’s original floor is of very good quality, so Syncro’s technicians left it untouched and concentrated instead on fitting protective liners to the bodywork. Painted steel sheet liners, laser-cut to ensure a perfect match for the body panels, were applied to the doors and side walls, while the wall between the load compartment and the cab was protected with a bulkhead liner in aluminium tread plate. 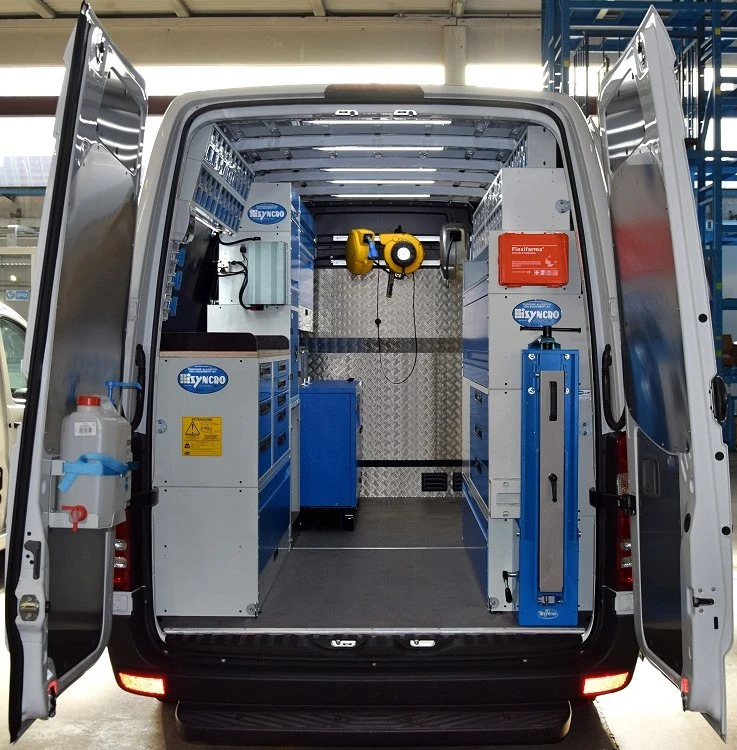 The racking system installed in the Sprinter was designed to enable the van’s operators to work either inside or outside the van, and the need for a generous supply of electrical energy and compressed air was satisfied by fitting a powerful but compact compressor-generator combo and an inverter. But let’s take one step at a time. 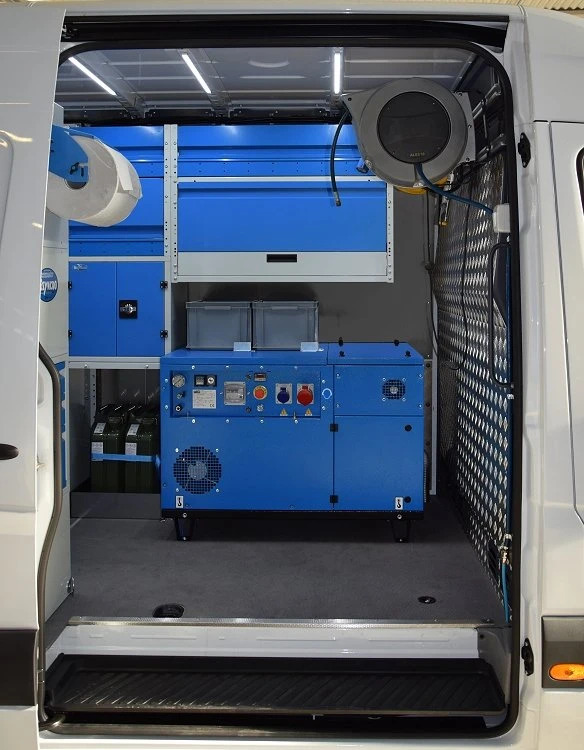 On the left of the van, the bottom of the racking consists of a wheel arch cabinet with a top door and a fold-down bottom panel, a compartment containing two cans for oil and fuel and a large space reserved for the compressor-generator combo. Over the wheel arch cabinet up are two drawer cabinets with a total of eight steel drawers, all mounted on telescopic runners and complete with space dividers, non-slip mats and an automatic system for keeping them shut. On top of the two drawer cabinets the Syncro team fitted a robust plywood work surface with raised fences for servicing and repair operations inside the van. Alongside the work bench is a locker with key and three shelves, all with non-slip mats, space dividers and access doors plus a flat shelf with top and bottom doors. Moving over to the right side, the racking here consists of a wheel arch cabinet with a door at the bottom, and two drawer cabinets, each with three metal drawers, above it. The cabinet furthest into the van opens to the side, so that its drawers can be accessed easily from the side door. Further up we come to a shelf with a door, a second, open shelf, a cabinet containing a total of 18 pull-out transparent drawers and, finally, a cabinet of 12 tilting containers. Another 20 tilting containers are installed over the work surface on the left. Transparent drawers and containers have long been one of the best-selling products in the Syncro catalogue: these extremely practical and tough products are made from PMMA, the same material used to make aircraft windows. A large number of accessories has been installed too. A handwash kit with Pulicream liquid soap is fitted to the left rear door. A fold-away vice support with a forged steel vice on a rotating base is fitted at the back of the right side racking, along with a spray can holder and a first aid kit. The installation also includes a paper roll holder, two racks for 25 litre cans and six powerful but compact LED ceiling lights, one of which is positioned directly over the work bench. Also worth noting are the two large, grey plastic containers. What really sets this racking system apart is the compressor-generator combo itself, which boasts specifications of 6.5 KVA at 230 V and 360 litres / minute of compressed air at 10 bar. 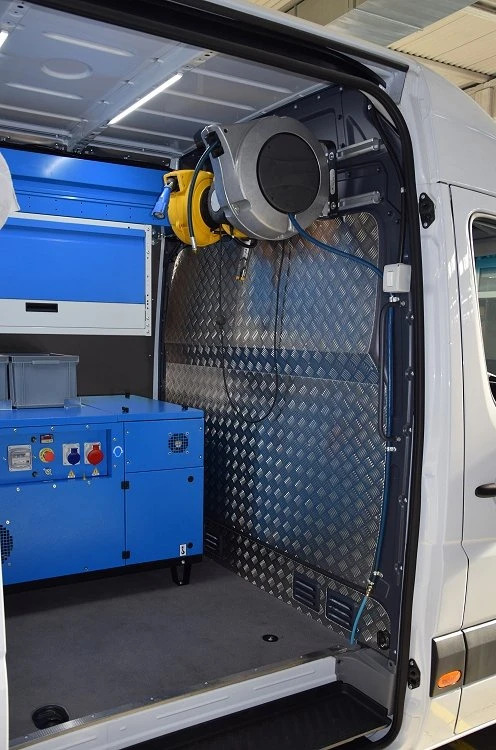 To allow the compressed air and electrical energy supplies to be used both inside and outside the van, the Syncro team provided sockets and couplings in the van along with cable and hose reels. Another point of interest is the inverter, which can deliver energy even without having to start the generator, and incorporates a battery protection device to avoid discharging the vehicle’s battery too much. Thanks to this superbly equipped workshop on wheels, the task of servicing earth moving machinery has become so much safer, faster and easier, to the delight of the van operators and to the great satisfaction of the Syncro team, who found an answer to each of the customer’s requirements!